Absolutely lovely B&B in a narrow cobblestone street in medieval Gent, about 2 blocks from the castle, and a very easy walk to lots of shops and sightseeing. WONDERFUL breakfast (Myriame even cooked eggs for this American! ), and a full kitchen so you can cook other meals in if you want to. The downstairs front room (really an apartment) has a loft that could easily sleep 4+ kids, plus a full-size bed on the main floor, with lots of warm blankets & quilts. Myriame is so warm and welcoming, and great about giving directions and recommendations on places to go in Gent. Eighteenth-century charm and 21st-century conveniences. I will absolutely stay here when I'm able to bring my family back for a real vacation (this stay was just a side-trip from a business trip). Haben Sie in Myriame's Place verblieben? Erzählen Sie uns hier was Sie davon hielten, und helfen Sie anderen, eine gute Wahl zu treffen! * Ich bestätige, dass ich in Myriame's Place verblieben habe. 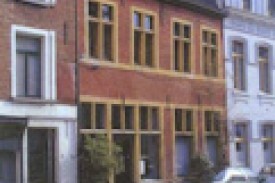 Sehen Sie andere bed & breakfasts in Ghent, alle bed & breakfasts in Gent oder alle bed & breakfasts in Ostflandern.